Styloid process radiologically seems as a long, tapering, thin radiopaque prominence, which is thicker at its base and protrudes down as well as forward. Lengthwise, it differs generally from approximately 0.5-2.5 cm. From the styloid process the stylohyoid ligament spreads out towards the lesser horn of the hyoid bone. 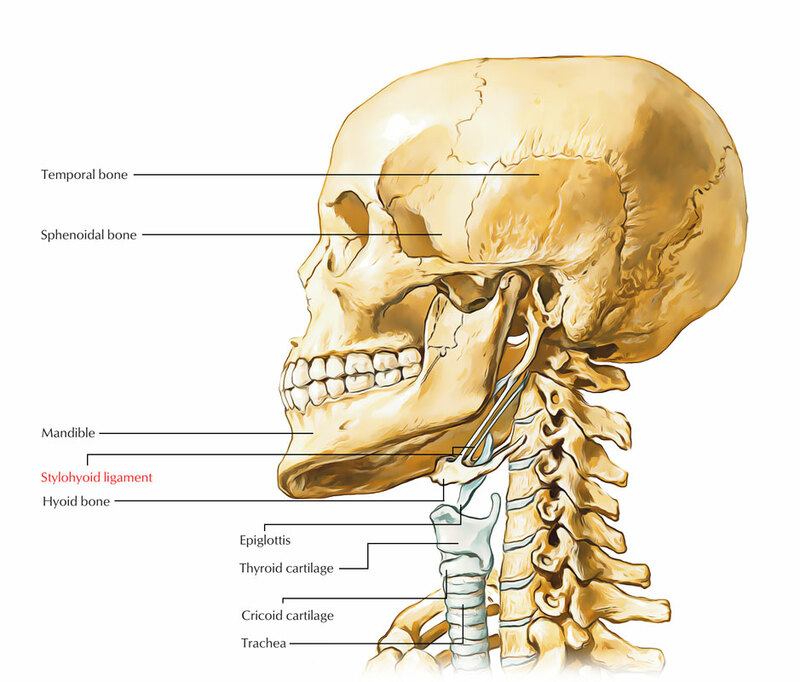 The stylohyoid ligament has its point of origin from the styloid process of the temporal bone and point of insertion within lesser horn of the hyoid bone afterwards. Apex of the styloid process of the temporal bone. Lesser cornu a.k.a. lesser horn of the hyoid bone. The stylohyoid ligament creates a portion of the styloid apparatus. Part of the origin for the middle pharyngeal constrictor muscle along with styloglossus muscle is made by the stylohyoid ligament. It starts to grow from the 2nd branchial arch. From the base of the skull ossification of the stylohyoid ligament generally spreads and arises usually bilaterally. But, sometimes the ossification begins at the lesser horn of the hyoid bone and even rarely in a central zone of the ligament. Stylohyoid ligament ossification is clinically asymptomatic in majority of patients. At the time of swallowing, few patients may have a vague, nagging to intense pain within the pharynx, turning the head or opening the mouth mainly on yawning. The condition is known as Eagle’s syndrome when this phenomenon is related to pain as well as the patient has a current history of neck injury, e.g. tonsillectomy. By impacting on the glossopharyngeal nerve, the symptoms are caused by the elongated styloid process and local scar tissue.